1. Lifetime gifts reduce estate taxes. If your estate exceeds the exemption amount — or you believe it will in the future — regular lifetime gifts can substantially reduce your estate tax bill. 2. Tax laws aren’t permanent. Even if your estate is within the exemption amount now, it pays to make regular gifts. Why? Because even though the Tax Cuts and Jobs Act doubled the exemption amount, and that amount will be adjusted annually for inflation, the doubling expires after 2025. Without further legislation, the exemption will return to an inflation-adjusted $5 million in 2026. 3. Gifts provide nontax benefits. Tax planning aside, there are other reasons to make lifetime gifts. 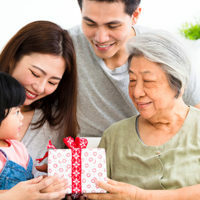 For example, perhaps you wish to use gifting to shape your family members’ behavior — for example, by providing gifts to those who attend college. And if you own a business, gifts of interests in the business may be a key component of your ownership and management succession plan. Or you might simply wish to see your loved ones enjoy the gifts.